Purple Haze 1 is a Sativa Marijuana strain, an updated and greatly improved strain from the so famous Purple Haze that became popular thanks to Jimmy Hendrix's song. Highly psychoactive, vigorous, high yielder with a durable ehigh that was created by crossing Purple Haze and Thai. Purple Haze #1 is a sativa Marijuana strain but is not a regular sativa - is nothing more and nothing less than an updated and much improved version of the so famous Purple Haze, one Marijuana that became popular thanks to Jimmy Hendrix's song. See our article on the history of Purple Haze #1. This strain is very different from the original Purple Haze, this last specimen had rather low productions and a moderate psychoactivity that however was once the most consumed weed in Woodstock. 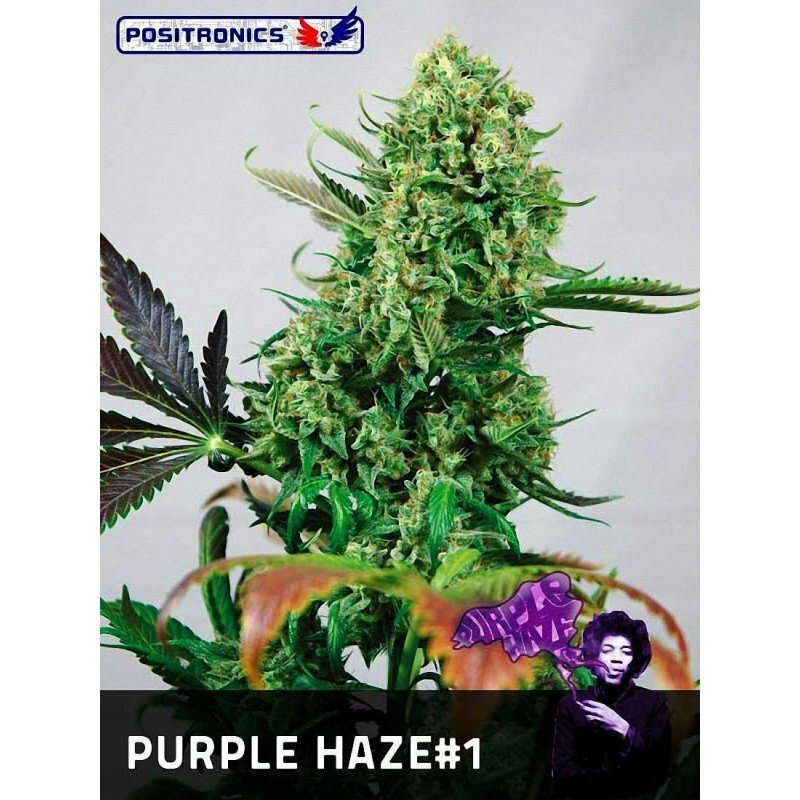 Today, Positronics presents a psychoactive, vigorous, high yielder and vastly version with a durable high, created by crossing Purple Haze and Thai. The plant grows in a strong manner producing average thickness branches and becoming a fir-like plant that sooner or later will need some kind of support due to its huge branches. Its has a great internodal distance and both the branches and its few but large leaves will become purple during the harvest, presenting a wide range of shades from garnet to purple through red and blue tones. In fact, this plant will be by far the most beatiful plant you can have in your garden. Due to its size, Purple Haze #1 demands a good amount of space and water, not being the best choice for those who only have a balcony or window. If you grow it in a growing room, we recommend to skip the growth period and move on directly to bloom as otherwise it will take over of the entire room. Besides that, make sure to use the ventilations systems to prevent the development of moisture and to facilitate the development of its own flowers. If you follow these recommendations you will be able to collect outstanding returns of 400g per square meter after 70 days of waiting. In the garden, it is advisable to delay the growing until June or July to slow down its growth or apply a good pruning to control its height. In any case and towards the end of October you will harvest 350g per plant. When smoked, you will feel an intense scent of ncense and cinnamon with an acid touch that you will recognize immediately if you smell it again. It will leave in the mouth an acid and sweet taste with an incensed and spicy background wit a mixture of flavours that you will not forget. But above all, this strain stands out for its cerebral, creative, fast-acting and durable effect effect, an uncontrolled ascent that will make you feel that everything floats and rises, even your own body. Due to this kind of effect we recommend to consume it in moderation.